This recipe falls into quick weeknight dinner that is not frozen pizza or Chinese takeaway category. 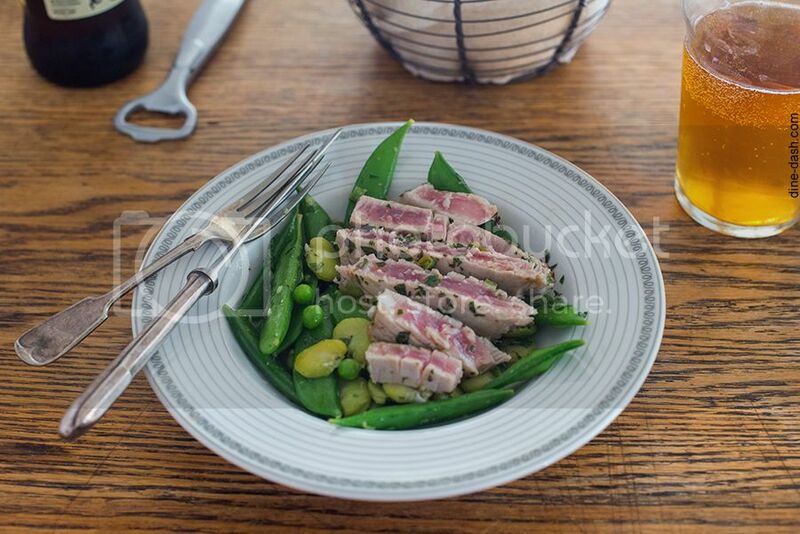 All you have to do is to steam the vegetables, prepare dressing and pan-sear tuna steaks. It takes 15 minutes tops, but you can feel almost like a professional chef when serving dinner. 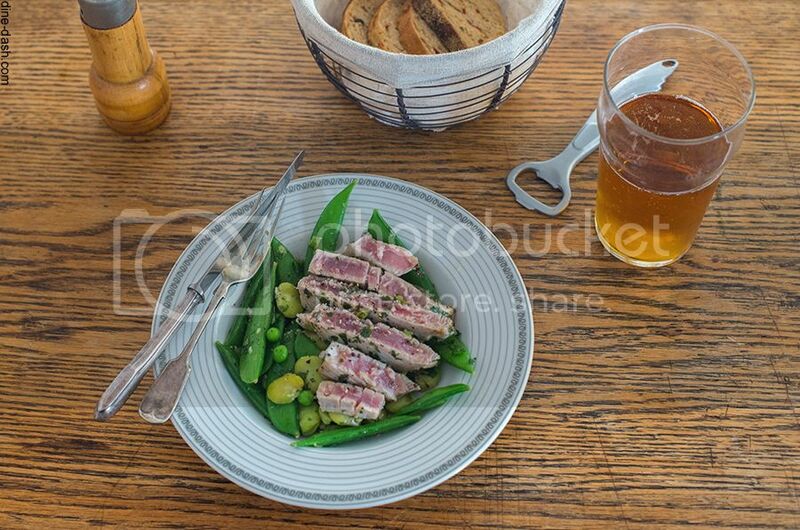 Marinade tuna steaks for abou 30 minutes (it can be longer or a little shorter, if you don't have time). Steam snow peas and broad beans for a few minutes, so that they soften, but are not overly cooked. Combine dressing with peas and beans. Transfer vegetables into two plates. Pan-sear tuna steaks for one or two minutes each side. Slice the steaks and place on top of the vegetables. Top with freshly ground pepper. You probably have all heard about , right? And most of you have tried it at least once. So have I. But while I can easily evoke a mouthwatering image of a colourful salad, naming its ingredients comes up as quite a challenge. And this time it’s not me to cause the problem, it’s the salad. Finding the ultimate recipe seems impossible. Ok, so I didn’t verify this, but I’m willing to make a bet that ordering in each bistro on the French coast, you will end up eating a different meal every time. The first version of the salad was limited to tomatoes, anchovies and a few drops of olive oil. We will find tomatoes in most of the contemporary variations of the salad - either cherry tomatoes, or thick slices of the larger ones. Anchovies either go together with tuna or substitute it. Personally, I cannot imagine a Niçoise salad without tuna, which is also the reason why I have avoided this particular salad for years. My aversion to canned tuna comes from the time when I was starting my culinary adventures at the age of 10. In one of the food magazines I found a recipe for tomatoes stuffed with tuna salad. Needless to say, this fancy presentation seemed like the essence of elegance and good taste (I was a huge fan of mini skewers at that time too), so I tortured my whole family with this dish on every occasion. I haven’t had the courage to ever try stuffed tomatoes again. 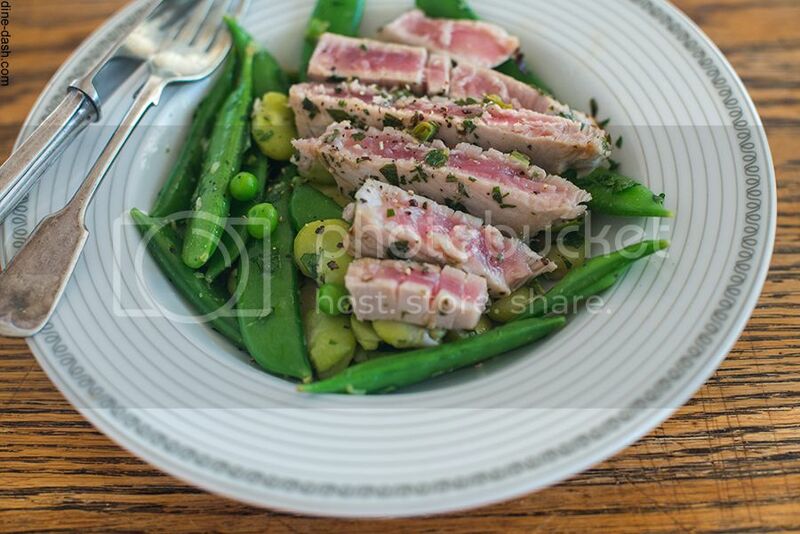 Luckily I have discovered that you can substitute canned tuna with slices of delicious, pink tuna steaks. Most recipes include haricot verts (or other beans), olives (black, Niçoise) and hard boiled eggs. Other add potatoes, artichokes, broad beans, slices of cucumber or radish, bell peppers, crunchy lettuce, capers, red onion or scallions. When it comes to dressing, different variations of vinaigrette are the most popular (with garlic, with red wine vinegar, with herbs), followed by olive oil mixed with fresh herbs, like parsley or basil. The good new is that you can make whatever you want and still call it . I didn’t care for eggs, went with fresh tuna, grilled everything that was grillable and opted for traditional vinaigrette. You can do something similar. Or something completely different. Parboil the potatoes so that they're mostly cooked, but not perfectly soft (about 15 minutes). Let them cool and slice in halves. Blanch green beans (about 5 minutes). Grill potato halves, beans, onion quarters and tomatoes. The time depends on your grill, ingredients and individual preferences. Potatoes should be tender and golden, beans should remain crunchy, onion should be browned and tomato skins should start wrinkling. Place grilled vegetables on a plate, together with olives. Grill tuna fillets for about 30 seconds each side (or longer, if you prefer the tuna well done). Slice the tuna and place on the salad. Sprinkle with salt and pepper, drizzle with lemon juice. Top the salad with vinaigrette. Serve with bread and white wine.